On June 6, I visited Kipster, the most animal, environment and people friendly poultry farm in the world. Inspired farmer and co-founder Ruud Zanders told a diverse group of Nyenrode Business University alumni all about global food production issues and the downs and outs of farmers and chicken. His story started just after the Second World War. Amongst other goals, the Marshall Plan strived to enable growing as much food as possible at low prices. The Netherlands developed into an international frontrunner in the field of efficient food production. The motto became producing as much food as possible at the lowest possible costs. Livestock farms increased in size, with less eye for the needs of people, the environment, and the animals. Today, we struggle to cope with a surplus of manure, we need to import feed from other continents, and many animals live in conditions that can’t see the light of day. And the farmers? They too are in a hard place. In just five decades, protest marches changed their demands completely, from “we demand meat” to “make mincemeat out of the meat industry”. How do you turn this around? The majority of the global population eat little or no meat. But as their prosperity increases, they look towards the western world as an example and increase their meat intake. But are we even the right example to follow? If we do not change our diets, we will need to produce as much food in the coming 50 years as we did in the past 4000 years. Meanwhile, chicken and other livestock compete with people for grains, other valuable feedstocks, and clean water. Increasingly efficient production methods alone cannot solve this. We will need to fundamentally change the way we eat. Will eating meat be compared to smoking? At the moment, 5% of the Dutch population does not eat meat (vegetarians); 30% consciously eats less meat (flexitarians). Most of them do this because of animal welfare, religion or health reasons. Now, there are also climatarians, people who adjust their diet to spare the climate. An adult needs about 60 grams of protein per day. Wageningen University (top-ranked agricultural university in the world) has done the maths; we can feed the world if 7 to 27 grams of our protein intake is animal-based and the rest is plant-based. If we continue to eat like we do now, we use up too much land for feedstocks, greenhouse gas emissions and water usage contribute to climate change, and farmers and their surrounding communities continue to suffer as well. 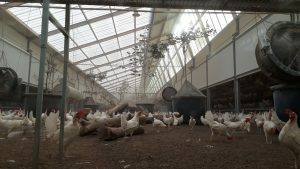 In the past years, the Kipster team worked with animal and environmental protection NGOs and Wageningen University to develop a completely different poultry farm. The first one opened in the Netherlands. The white chickens need 5% less food. The food they eat is made of residual flows which are not fit for human consumption, like stale bread. Dutch Lidl stores sell the eggs, at a price point that is fair for both the farmer and the consumer. Rooster chicks are not gasified, but instead are turned into burgers and other products, along with the hens that no longer lay eggs. The chicken manure is dried and sold to farmers as fertilizer. Special extraction systems filter out the fine dust particles improving the air quality for staff and neighboring communities. 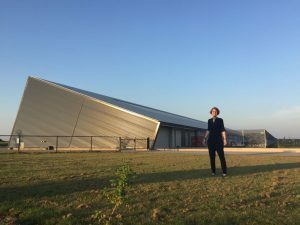 And the solar panels on the roof of the spacious barns generate so much electricity that Kipster does not just sell eggs, meat, and fertilizer, but also renewable energy. Things are going well for Kipster; the eggs are so popular that they are already scouting new locations to expand. The average Dutch person consumes 70 to 75 grams of animal protein per day. Far too much to set the right example as the world champions of food production. Or to lead the transition to more plant-based protein. Yet, it was no surprise that at Kipster, they served us a delicious vegetarian buffet after the inspiring story and tour of the premises. We had plenty of food for thought and conversation as we dined on the dust-free terrace next to the farm. If you want to visit this unique farm, it’s good to know that Kipster welcomes visitors every day; you are welcome to visit any day between 10 am and sunset. For more information, please consult the Kipster website. If you’d like to stay up to date on events organized by the Nyenrode Alumni Circle for Sustainability, you can sign up for the mailing list via this link. Written by Marjolein Baghuis (@mbaghuis) for the Change in Context blog and Nyenrode alumni website. To read about interesting people, book reviews and other posts about sustainability, change, and communications please subscribe to this blog in the right-hand column.